The E4899A 100 Gb/s Serial BERT enables research labs and standard bodies to test next generation ultra-high speed links designs. 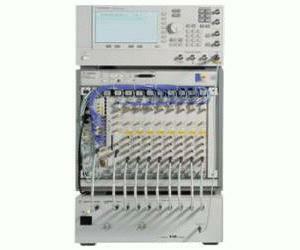 The E4899A 100 Gb/s Serial BERT is based on the Agilent ParBERT 81250 and the new high-speed E4898A 100 Gb/s BERT Front-End. The E4899A is the only BER test solution on the market for data rates up to 100 Gb/s. The E4899A stimulates the device with either PRBS or memory based patterns.